Living & Working on Sheppey from Blue Town on Vimeo. Every building on the High Street and West Street was photographed. The background and any building not on the street building line was taken out. This resulted in a visual audit of the existing fabric of the two Streets. 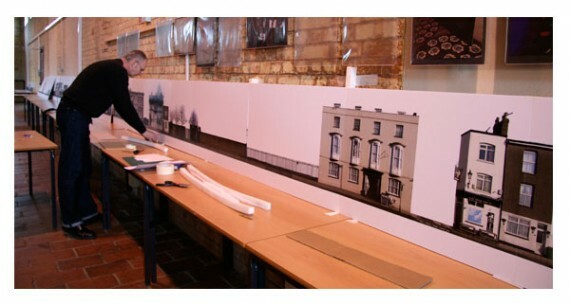 A complete streetscape 20m long overall was constructed from the photographs. Old photographs of Blue Town held by the Heritage Centre were viewed in order to find historical buildngs to fill the gaps in the current High Street. These were manipulated in order to be able to place them in the streetscape. Strand 1 Reminiscences of Working Lives: Older ex-residents of Blue Town assisted in placing the historical buildings in the High Street. They also took part in the making of the video by walking the length of the street recounting who had lived where and various incidents that had happened in locations along and around the High Street. Strand 2 Young People Imagining the Future: Young people contributed to the construction of the video by designingbuidings and business that they thought were necessary for the development of the High Street. These buildings were then incorporated into the streetscape. The young people were also recorded exploring Blue Town with Jenny Hurkett as part of their research. Setting up the photographic model of the High Street. The DVD: A 15 minute recorded pan along the panorama with added incidents and recorded reminiscences. Reminiscences of Blue Town were also added from the one to one interviews undertaken in Strand 1.